If you're shopping around for an inexpensive tab but you're on a budget, don’t worry, Cherry Mobile just announced on their Facebook page two new Android devices that are sleek and won’t hurt your wallet. 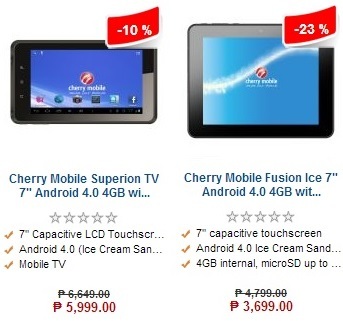 First is the Superion TV, Cherry Mobile’s first tab with mobile TV function for only Php5,999! Next is the affordable Fusion Ice for just Php3,699! More about the Cherry Mobile Superion TV and Fusion Ice after the jump. The Cherry Mobile SUPERION TV, is the first ever tab with mobile TV function from Cherry Mobile and is designed for consumers who spend much of their time on the road. It runs on Android 4.0 Ice Cream Sandwich and boasts a 1GHz processor, 4GB onboard storage, 512MB RAM, call and text function, VGA front camera, built-in Wi-Fi and an expandable memory up to 32GB via microSD card. The Cherry Mobile FUSION ICE with its excellent design, useful features and a Php3,699 price tag, it is truly one of the cheapest ways to experience the best that the Android OS has to offer! 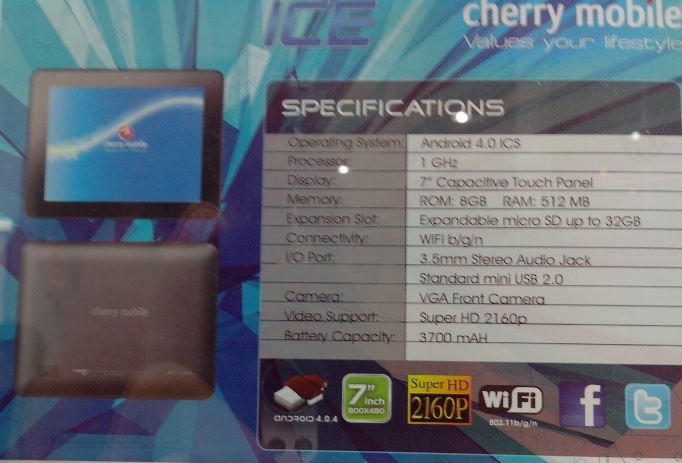 Running on 1GHz processor and Android ICS, FUSION ICE has a 7-inch HD LCD, 8GB of internal storage and 512MB of RAM. - Some of the specs of the Cherry Mobile Superion TV and Fusion Ice is still not available at this moment. We'll update this post once we know more about the specs of the Cherry Mobile Superion TV and Fusion Ice, so stay tuned! - If you own one of this tablets, please share some of your experiences and opinions about this tablet, so that others may be aware of it. Thanks! (01/20/13) Cherry Mobile Superion TV actual unit and retail box! (01/15/13) The Cherry Mobile Superion TV and Fusion Ice are now available at Lazada Philippines, the fastest-growing online shopping site in the country that offers a wide-array of products and provides a convenient, worry-free online shopping experience with – free nationwide delivery, 14-day return policy and cash on delivery. I have the superion tv and there is no notification bar. Weird . Sir,pwede bng laygan yn ng smrtbro?